Colombian President Juan Manuel Santos says rebels released a top general and two other hostages "in perfect condition." (CNN) -- Colombian rebels released a top military general and two other hostages Sunday in a move that could allow stalled peace talks to resume. Brig. Gen. Rubén Darío Alzate, who commands a 2,500-soldier counterinsurgency group and previously headed the Colombian army's anti-kidnapping unit, was among the hostages handed over to mediators in a rural area in western Colombia, the International Committee of the Red Cross said. The released hostages are "in perfect condition," Colombian President Juan Manuel Santos said in a Twitter post Sunday. 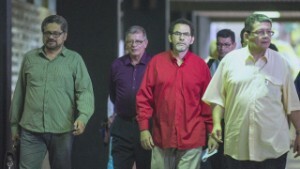 Colombia's Defense Ministry said they were being transported to the country's capital Sunday evening to reunite with their families and undergo medical checkups after 14 days in captivity. 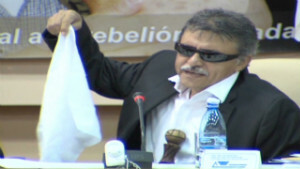 Local media reported that Alzate was the highest-ranking officer to be taken prisoner by guerrillas from the Revolutionary Armed Forces of Colombia during the country's bloody, five-decades-old civil war. The high-profile capture two weeks ago sent the peace talks in Havana between the government and the rebels, who are known as the FARC, screeching to a halt. 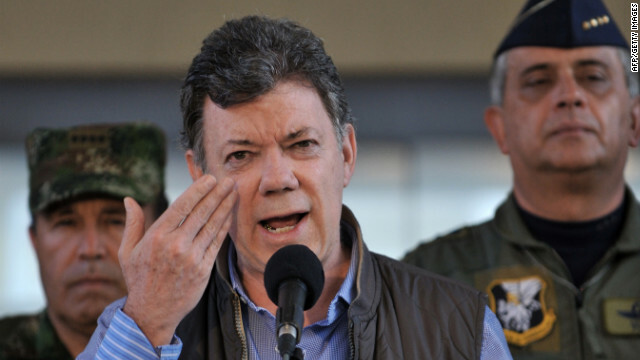 Colombian President Juan Manuel Santos suspended the peace talks, demanded Alzate's release and called on the country's military to investigate why the general had apparently broken protocol by venturing into rebel territory. But FARC leaders told reporters in Havana earlier this month that no such project exists in that area and that they were baffled by Alzate's presence there. On Twitter, Colombia's Defense Ministry posted a photo of the three freed hostages meeting with the defense minister and other military leaders. The U.S. government has provided Colombia's military with billions of dollars in training and aid to battle FARC guerrillas, who authorities accuse of massive-scale drug trafficking to finance their insurgency. Santos said in a statement that he would be meeting with his government's negotiators to discuss the terms of their return to Havana. The release of the hostages Sunday, he said, "contributed to restoring a climate conducive to continuing the talks, demonstrates the maturity of the process and permits us to unite our voice to those of millions of Colombians who express their solidarity with those freed." The rebels renewed their calls for a ceasefire in a written statement released Sunday, saying the guerrilla group must now "redesign the rules of the game." "It is time for a bilateral ceasefire, an armistice, so that no bellicose event on the battlefield can be used to justify the interruption of such beautiful and historic work as it is to agree on peace for a nation that longs for this destiny," the FARC said. After the hostages' release, a Red Cross official said he hoped the peace talks would start up again. "We hope that the peace talks between the Colombian government and the FARC-EP will resume soon," Christoph Harnisch, who heads the Red Cross delegation in Colombia, said in a statement. "We continue to support this process, with a view to alleviating the suffering of all the victims of this long conflict." CNN's Edwin Mesa and Nelson Quiñones contributed to this report.